A few weeks ago, I was looking back through some of my old photos from our family ski trips, and remembered that there’s loads of wildlife in the ski area we used to visit every year. For 15 years, we went to Alta, in the Wasatch Mountains near Salt Lake City in Utah. They have some of the world’s best snow, plus some of the ski area is part of the Wasatch National Forest, so it’s a protected area with lots of trees and meadows – and wildlife. Once I was a good enough skier to go off into the woods on my own, I did so, at every opportunity. I was always on the lookout for animals. We occasionally saw porcupines, and there were plenty of tracks from rabbits, foxes, and sometimes moose. 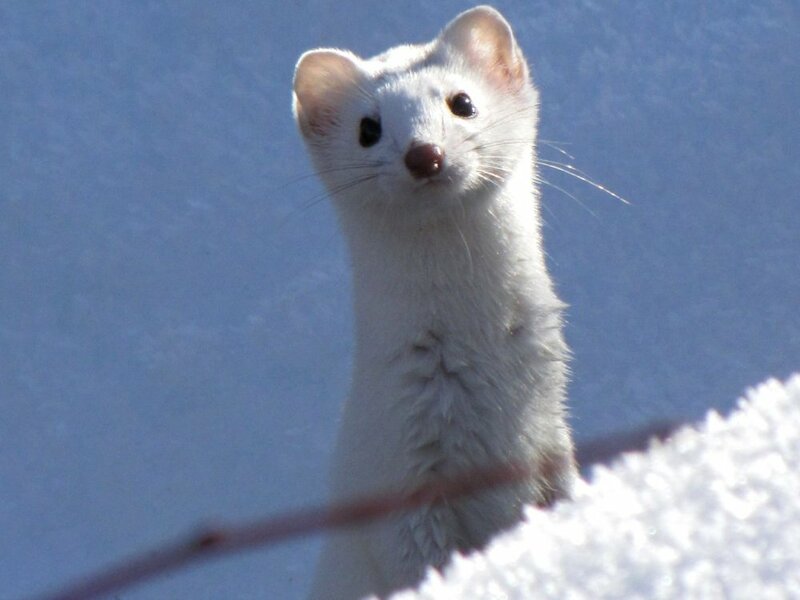 Every so often we’d see an ermine, although they’re pretty difficult to spot in the winter with their white coats. Bears live in the Wasatch Mountains too, but they hibernate, so we never had to worry about them in the winter. And of course there are plenty of birds, chipmunks, and Uinta squirrels throughout the year. At Alta, you don’t have to get too far from the main trails to find nature. Even just 10 meters into the woods, the snow covered trees muffle every sound. You silently plow through the knee-deep powder – it slows you down so much that you can look around without fear of bumping into anything (although you can certainly go faster if you want to – just watch out for the creek). Then a small sound might break through the calm. A bird twittering, or a squirrel scolding, or if you’re lucky, the sort of snuffling scratching noise that means there’s a porcupine in a tree nearby. I've never seen any sign of a moose while skiing, but I know other people have. But you don’t even have to be off-trail to see wildlife. One time, I came across a porcupine making his leisurely way across one of the main trails. He wasn’t fazed by the skiers in the slightest. When I stopped to watch him, he waddled right across the front of my skis, just a few feet in front of me! I suppose he was used to having these strange creatures with enormous fiberglass feet sliding down his mountain every year. I wish I had a photo, but I couldn’t reach my phone or camera without taking off my coat and everything. Porcupines can't throw their quills (a popular misconception), but I still wouldn't want to pet one! To see a truly spectacular photo of an amazing and adorable porcupine, check out Jenaya Launstein's story here on the Wild Focus Project. It’s a little strange to write about wintertime and skiing in the middle of NZ summer. I’ve been having a hard time getting into the holiday spirit when it’s warm enough for tank tops and shorts and sandals. It’s mind-boggling to see stores advertising beach gear and barbeque equipment for Christmas! But reflecting back on these ski trips has been a great reminder. Nothing beats being on the mountain first thing in the morning on a beautiful day. Happy holidays from the Wild Focus Project, and may your year ahead be filled with (safe) wildlife encounters and biodiversity!